Header photo of Omar al-Shishani in Syria, red beard on the left. Taken in 2014. Omar al-Shishani, ISIS’ minister of war who was killed via airstrike last month, was a creation of Saudi Arabia. I don’t mean that literally, of course. The full narrative is far more complex. Omar al-Shishani - birth name Tarkhan Batirashvili - was an ethnic Chechen born to a Georgian father and a Kist mother. With red hair and pale skin, al-Shishani (a common jihadi nom de guerre that's simply Arabic for "The Chechen") had the light features typical of people from the Caucus region. His parents’ union was an interfaith marriage, with his father raised in the Eastern Orthodox church and his mother’s side belonging to a clan of Sunni muslims. It wasn’t the sort of background that lends itself reflexively to ISIS’ brand of virulent fundamentalism - which in military practice has led to the wanton murder of Syriac Christians. The path that carried a former Chechen soldier toward commanding ISIS’ Syrian front was convoluted and fraught, made of both historical fallout and the intricate machinations of foreign powers. Like many young men from the Middle East and the Caucasus who go on to demonstrate an aptitude with guerrilla conflict, al-Shishani was naturally drawn to warfare and showed a precocious interest in combat operations. During his adolescence, he would reportedly assist and even accompany Chechen rebels on missions against Russian forces - tagging along with guerrillas who made their way through his native Pankisi Gorge. He subsequently joined the Georgian Army in his late teens, making a name for himself through his knack for weapon skills and gifts as a reconnaissance operative. His unit reportedly trained under the guidance of U.S. special forces who were prepping local recruits for combat against the Russians during the 2008 Russo-Georgian war. His military service was exceptional, though a spell with tuberculosis led to an immediate discharge that sidestepped him receiving any proper decoration. Unrecognized for his service, al-Shishani returned to his hometown bitter and disillusioned. It’s during this free fall that he started following the path that’s typical of jihadi recruits, one that funneled him into Syria along with a whole slew of markedly less talented flunkies and wannabe militants. Much of this was catalyzed, inevitably, through incarceration. Al-Shishani was imprisoned for a stretch of sixteen months for illegal weapons harboring following an arrest in 2010. As he outlined in a series of interviews with jihadi websites, his stint behind bars allowed him to mingle with a variety of hardline Islamists, exposing him to the extremist Sunni Islam that makes the core of ISIS’ doctrine. While his brothers-in-arms never recalled him displaying religious devotion during his time in the Georgian army, reports claim that al-Shishani fell under the tutelage of a charismatic Saudi national while incarcerated - one who spoke glowingly of Islamist struggle and sustained connections with a variety of influential jihadis. The man consistently praised the exploits of Thamir Saleh Abdullah al-Suwailem, a Saudi national who joined the Chechen insurgency against Russia, as a means of convincing al-Shishani of the unity of their struggle. Al-Shishani’s mingling with Saudi ideologues did not end when he was released from prison either, with the future jihadi commander traveling to Egypt in 2011 and meeting with a prominent Saudi cleric during his jaunt there as well. This kind of jail cell networking is far, far from a unique phenomenon. Though al-Shishani's skills as a fighter were clearly exceptional, the tipping point that brought him into the fold of militant jihadism is one of the most common motivators for ISIS recruits who take the one-way ticket to Syria’s battlefields. From the Caucuses to mainland Europe, prisons serve as recruiting conduits for jihadi entities who can't advertise in the open. It’s why so many ISIS recruits from Europe have a history of petty crime and drug addiction. These guys aren’t born believers or religious scholars - many of them remain ignorant of core Islamic tenets even by the time they reach Syria. They’re drifters and screwups, kids with no tether who make prime candidates for ISIS’ brand of violent fundamentalism. Which is what made the fighter once known as Tarkhan Batirashvili so exceptional - the guy actually had some know-how, and a considerable amount at that. On the subject of incarceration and slides into jihadism, a very similar process birthed ISIS’ supreme leader. Abu Bakhr al-Baghdadid, the group’s self-anointed caliph, networked with many of ISIS’ future luminaries while incarcerated at a military prison in Iraq. Al-Baghdadi spent most of 2004 in the notorious Camp Bucca, a U.S.-run installation that became a fertile breeding ground for violent jihadism. Locked up with little more than their own sectarian bitterness, hard time in Camp Bucca proved to be the catalyst that fused together much of ISIS’ standing command structure long before the organization began capturing territory in Iraq. It was also reported that hardline Sunni fundamentalists ran the facility's prison culture, turning the complex into a germination point for Iraqi jihadism. In total, nine members of ISIS' top command did stints at Camp Bucca until its closing in 2009. Another aspect of al-Shishani’s path that’s typical of foreign militants was his enlisting alongside various jihadi factions before becoming directly involved with ISIS itself. The Syrian conflict is profoundly murky, and outside of government forces (namely Assad’s Syrian Arab Army and the YPG militias of the de facto Syrian Kurdish state), the allegiance and structure of rebel factions are prone to manic reconfiguration. The gibbering pundit-speak about “moderate rebels”, as if such a definitive category ever existed, was little more than an attempt to impose some kind of false order and demarcation upon a conflict that’s fractal in nature - defined by the shifting activity of factions that coalesce and collapse based on ties to neighborhood, shared enemies, or religious sect. The amalgamation of rebel factions referred to as the “Free Syrian Army” (FSA) constitutes a range of largely Sunni Arab fighters spanning from secularists to hardline Islamists whose sole unifying trait is their hatred of Bashar al-Assad. Wings of the FSA recently broke away to join the Kurdish-led Syrian Democratic Forces (SDF), aligning themselves closer with the Kurds’ vision of a secular breakaway state. The SDF are now fighting Turkish-backed FSA regiments, turning ostensible former compatriots into de facto enemies as the two factions skirmish across Syria’s northern border. These odd fractal shifts have occurred within explicitly Islamist factions as well, with various jihadi groups coalescing and splintering over the span of the conflict. ISIS itself is a former wing of Al-Qaeda in Iraq, and has clashed with Al-Qaeda’s Syrian branch (the al-Nusra front) ever since their messy divorce in 2013. Al-Shishani came into ISIS’ fold after traveling to Turkey and making his way through the country's Chechen diaspora community. He served as a commander in the explicitly Islamist Muhajireen Brigade, and fought alongside similar compatriots in al-Nusra and the Tawhid Brigades during various assaults against Syrian government targets before swearing allegiance to ISIS while bringing many of his comrades along. But let’s take a look at those earlier jihadi factions for a moment. While Syria is overrun with a complex roster of local insurgent groups, the Middle East’s more powerful nation-states have a vested interest in leveraging the country’s myriad power shifts for the sake of gaining a regional edge. Syria has evolved into a complex proxy war, one defined largely by the rancorous Shia-Sunni divide. Bashar al-Assad’s Shia government has received heavy assistance from Iran and their proxies in Hezbollah, something that’s been open and declared for much of the conflict. The various Sunni insurgents, however, have been recipients of a more shadowy form of support from Iran’s primary nemesis. Saudi Arabia has long made a practice of attempting to seed and nurture hardline Sunni factions and Islamist militants throughout both the Middle East and central Asia. Though an inherently messy and difficult-to-control process, leveraging proxies can also be an inexpensive and hands-off way for more powerful entities to assert control and power within a region of interest. Saudi Arabia has a thorough history of backing Sunni jihadism, a pathology that has reemerged with full force during the Syrian conflict. The Saudis have sent weapons and resources directly to hardline Islamist factions hostile to the Assad government, including forces affiliated with al-Nusra and other groups that al-Shishani once fought besides. This transfer of arms has inevitably led to the diffusion of weapons amongst jihadi factions who might otherwise lack armaments of that caliber, providing logistical support to the array of militias that draw Islamist fighters. And these groups can easily shift and metastasize beyond the whims of foreign meddlers. The organizational behavior of jihadi groups is not all that far removed from that of corporate firms with their merging of assets and hostile takeovers. When Omar al-Shishani and many of his former underlings in the Muhajireen Brigade joined ISIS, they brought both arms and tactical know-how with them. When Saudi Arabia pumps resources and capital into these same fledgeling jihadi groups, the newly empowered breakaways can snowball that momentum into larger and nastier forms. Though there’s no open indication ISIS receives direct backing from the Saudis, there’s no doubt the group has been a beneficiary of the kingdom’s machinations. In the case of al-Shishani’s exposure to Saudi-funded jihadism, his first glimpse hit a little closer to home. There’ve been persistent questions about Saudi coordination in propping up Islamist fighters as a means of pushing back against Russian influence. As a report from The Guardian notes, wealthy Gulf sponsors have an alleged history of providing money and aid to anti-Russian jihadis in Chechnya. Russian officials have openly accused Saudi Arabia of directly funding local Al-Qaeda networks, stating this occurred as a matter of deliberate and consistent policy. Russian intelligence has estimated that a particular Saudi-based charity has provided around $50 million in aid to jihadi elements throughout Russia and Chechnya. All evidence suggests that the Saudi backing of local extremist factions allowed these groups to gain a stronger ideological and networking foothold than they otherwise would - making it all the easier for recruits like al-Shishani to filter into the latest jihadi hotbeds in the Middle East. The resultant pattern is that whenever a region becomes a promising theater for Sunni jihadis, recruits from North Africa to the Caucuses magnetize to the area - frequently doing so through preestablished channels. The Saudi support for Sunni extremism came through more soft-sell forms as well. Saudi Arabia bankrolled the construction of local Mosques in the early 2000s that openly preached hardline wahhabism, a sharp contrast to the more moderate Sufi Islam that had characterized Chechen spirituality for centuries. All signs indicate Saudi elements made a concerted effort to manipulate the character and inclinations of Chechen Islam, encouraging the rise of extremism as the country became enmeshed in its second separatist conflict with Russia. While countless American pundits have screamed themselves hoarse trying to pin the behavior of jihadi extremists onto something innate to Islam as a religion, effectively none of them have evinced any awareness that the permutation of Sunni jihadism often springs directly from the machinations of an ostensible U.S ally. The Second Chechen War also proved to be an exceptional training ground for would-be jihadis. Many ISIS recruits - particularly more well-off boys from the Gulf states and Europe - often have no military training and provide negligible combat value, frequently being exploited as front-line cannon fodder. The Chechens, however, are a different story. The Chechen-Russian conflicts were unspeakably brutal, and bred a kind of fighter who was particularly useful during ISIS’ 2014 campaign of hyper-aggressive flatlands blitzkrieg. ISIS performed best as a fighting force when they were barreling across the open desert of western Iraq and central Syria, an environment that mixed well with sheer momentum and dumb ferocity. It’s also the ideal environment for a regiment of hardened Chechens - fighters who can easily fall back on untrammeled pitilessness and violence. 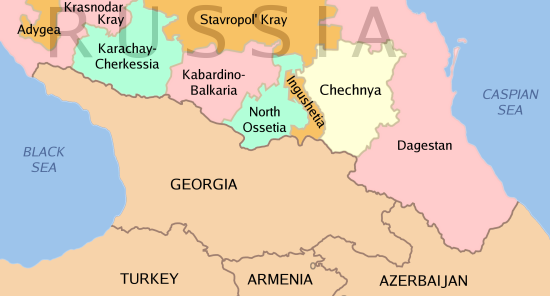 It's a conflict that gets very little attention in the West, but the strife between Russia and Chechnya following the collapse of the USSR was notoriously savage. It was also the kind of conflict for which there was no definitive end, one that was catalyzed by a grueling post-Soviet partition and the violent power struggles that emerged once the old empire collapsed. As has been the case with other messy struggles for partition and autonomy, the ultimate response from the parent state was to inflict a barrage of harrowing violence for the sole purpose of crushing all attempts at independence. Which, in the case of both the post-Soviet Chechen wars, resulted in catastrophic death tolls and widespread cruelty against Chechen noncombatants. The First Chechen War was fought from 1994 to 1996 and led to a sort of de facto autonomy for the Chechen state. The Second Chechen War was fought largely under the guidance of Vladimir Putin (ready to assert his strongman chops as Russia's newly elected Prime Minister), and was designed to break national self-determination and reestablish Russian control. The conflicts were estimated to have resulted in the death of no less than 75,000 civilians in aggregate, the vast majority of which were ethnic Chechens. As a point of comparison, Chechnya's standing population was around 1,260,000 as of 2010. While the numbers are hazy and uncertain, it's possible that both wars together may have left a death toll in Chechnya closer to ~10% of its current population. Though this may also be lowball figure, with various Chechen sources contending that over 200,000 perished across the course of both conflicts. The Second Chechen War was notorious for the wanton murder of noncombatants, something that allegedly went encouraged by Russian military command. The massacre of Chechen civilians was endemic, with no less than 57 mass graves having been discovered as of 2008 - some of which were stumbled upon by local construction crews. Thousands of civilians remain "disappeared" and unaccounted for, and there have long been accusations that Russia continues to conceal the full extent of its crimes against the Chechen people. Chechnya is now ruled by military junta under the watchful eye of a Putin lackey and death squad commander named Ramzan Kadyrov, a figurehead who remains widely despised. Any Chechen who managed to survive amidst the horror of the various conflicts represented an ideal ISIS recruit. Chechen fighters as a whole have a reputation for ferocity, and the region's local Islamists remained adrift and angry in the wake of Russia’s brutal incursion. When the black flag of jihad went up in Syria, it was only a matter of time before Chechnya's Islamists began their Levantine trek. The alien, Saudi-style fundamentalism that had spread into al-Shishani's native Pankisi Gorge region had been so successful in radicalizing local youth that older villagers were apparently relieved when fighting began in Syria and young Islamists started leaving the area. Which brings us back to al-Shishani himself, and what his death has done to ISIS’ fortunes. The short answer is - quite a lot for only one commander. There’s a cold methodology to assassination and the removal of figureheads within a militant network. You don’t puncture the command structure of an organization indiscriminately. It’s poor practice to eliminate the personalities within a leadership apparatus who are demoralized, bribable, clumsy, or lacking in smarts and acumen. These are the exact people you want to preserve - those who offer little value and are easily replaced. The ones who are intelligent, charismatic, determined, possessing connections or skills that cannot be replicated - those figureheads represent priority targets. This style of clinical examination can even lend itself to a kind of wry morbidity - the more you discuss the hierarchy of an organization and eliminating the personalities within, the more you realize that the age-old practice of assassination is like being a human resources director with better aim. And speaking of human resources, ongoing intelligence assessments have outlined that the (rather anticlimactic) death of al-Shishani will likely kneecap ISIS’ ability to recruit militants from Chechnya - hobbling the flow of their most high-value foreign fighters. This is yet another circumstance where al-Shishani proved irreplaceable, and one of the numerous reasons as to why choosing him for removal abided by the key tenets of target selection. As the chief U.S. military spokesman in Iraq remarked upon news of his death, "There isn’t a second guy, to our knowledge, to step up and operate at his level". The Kurdish-led Syrian Democratic Forces (SDF) have been cutting closer to ISIS' core holdings in Syria, and al-Shishani was consistently brought to the front in an attempt to counter Kurdish infantry strength. He was summoned to help bolster ISIS during the fateful battle for Kobane, and was killed while attempting to stave off the SDF as they liberated the city of al-Shaddadi. The Kurds have proven to be the jihadis' fiercest opponents, with ISIS reserving their best commanders for confrontations with the SDF. Now that al-Shishani is gone, ISIS' hold on central Syria looks more fragile by the day. Knowing the hardness and determination of Kurdish fighters, it's probable that Raqqa's governing body will have much shorter facial hair not too far down the line. When you look at ISIS’ message, their methods, and their goals, you quickly come to the realization that they’re not going to be attracting geniuses. Those who deliberately wander into the organization’s fold are much more likely to encompass a slew of fanatics, deranged hardliners, idiot sadists, and very dumb young men too clueless to know any better. A 20-something guy who thinks, "Wait, you’re telling me I can join a militia that’s trying to turn itself into a state while lacking coherent structural development plans and squatting in the midst of a flat, open desert surrounded by enemies who have serious air power… sign me up!" is your prime demographic. Which is why it’s all the more crucial for the anti-ISIS coalition to take out the members of their command structure who actually do possess serious talent and know-how. With al-Shishani having died an ignominious death by airstrike, it not only removes him from the picture but also cuts a lifeline to the more skilled jihadis that filter in from Chechnya. The removal of al-Shishani is a demonstration of how ripping one particularly valuable thread from an insurgent network can have a sizable impact on their operating capacities. There’s been criticism, much of which I feel is highly valid, about America’s over-reliance on technological means to combat jihadi entities in lieu of more measured human intelligence methods and old-fashioned tactical analysis. The successful airstrike against al-Shishani represents a fusion of the two, a pinpoint assault that uses modern capabilities to implement age-old solutions against hostile insurgency. Strike at the most crucial parts of their anatomy, and the network will begin to fracture under its own vulnerabilities. Header photo taken from Jihadi media outlet al-Itisam Media. Adam Patterson can be reached by email at "napalmintheAM@gmail.com" or on Twitter @AdamPattersonDC.